Chief executive officers and chief financial officers in Singapore may soon be legally liable for their certifications that their companies' financial statements are true and fair. This possibility was touched upon by Minister of State for Finance and Transport Josephine Teo at the Public Accountants Conference yesterday. 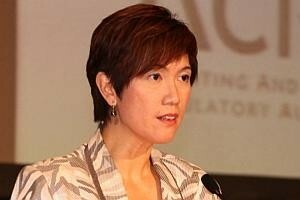 Mrs Teo, speaking to an 800-strong crowd of mostly practising accountants, said the profession's regulator, the Accounting and Corporate Regulatory Authority (Acra), is exploring various approaches taken by other jurisdictions to further strengthen the quality of financial reporting - an issue of some concern here. "Unlike in Singapore, where the statutory responsibility for financial reporting rests only with directors, other jurisdictions have introduced legal responsibilities for other office holders beyond the directors," Mrs Teo said. "For example, in the US and Australia, the CEOs and CFOs of listed companies have to certify or declare that the financial statements are true and fair, and comply with the accounting standards. The implications of making false reports in such jurisdictions range from criminal penalties, to fines or disqualification from holding a management position." She emphasised, however, that "there is a broader aim to making CEOs and CFOs legally liable . . . (which is to have) management take ownership of putting in place the right systems and people to enable the preparation of accurate financial statements". "Acra will study the options available and consider relevant factors such as the skills and competencies of our preparers, and the readiness of our companies to meet more stringent requirements," she added. Acra also intends to strengthen financial reporting by extending the focus of its Financial Reporting Surveillance Programme - where selected financial statements are reviewed to determine if they comply with the Singapore Financial Reporting Standards - from listed companies with modified audit reports to include financial statements that do not necessarily have modified audit opinions but are of public interest, Mrs Teo announced. The quality of financial reporting was the topic that took centre stage at this year's conference, which is an annual event organised by Acra. The regulator yesterday released a report based on a survey it conducted with ACCA (the Association of Chartered Certified Accountants). It found how significantly the lack of quality in financial reports produced by preparers affects the focus of the audit process and the value offered by an audit. Specifically, the survey found that when preparers are not able to produce financial reports and supporting audit schedules that are timely and up to the mark, auditors end up investing a lot more time working with the preparers to get the fundamentals right and correspondingly much less time engaging in value-adding work. "These survey findings underscore the pressing need to re-examine the responsibilities of each member of the financial reporting eco-system . . . Quality financial information is the lifeblood of strong and vibrant markets," said Acra's chief executive Kenneth Yap. The survey received 533 responses from preparers in various industries, and was followed up by a focus group discussion with various stakeholders in the financial reporting regime. They found that companies and preparers need to firmly take ownership of their financial statements; about half the survey respondents actually thought the primary responsibility for financial preparation fell on auditors rather than them. Mrs Teo commented: "Auditors have found themselves spending significant time and resources to get the management accounts in order before a proper audit can take place . . . Auditors should, rightfully, not be involved in drawing up the same financial reports that they audit. We should address this issue before it becomes a norm." To help both stakeholders improve the quality of financial reporting, CPA Australia and Singapore Management University (SMU) yesterday launched a book that will help preparers produce more accurate financial information, and auditors to keep up with the latest developments in International Financial Reporting Standards so that they can better advise their clients. Getting Your Accounting Right has contributions from, besides others, technical experts from the Big Four and mid-tier accounting firms, Acra, SMU and CPA Australia. Acra also released its seventh annual Practice Monitoring Programme Public Report, which reports on its audit inspections and other activities to promote audit quality. It showed progress made by some audit firms in the public interest entity (PIE) segment in establishing strong quality controls, but also highlighted how the workload of some firms in the non-PIE segment poses a major threat to audit quality.